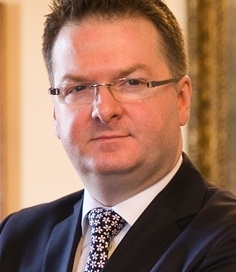 Ewan Venters has been Chief Executive Officer of Fortnum & Mason since August 2012. On his appointment, Kate Hobhouse, chairman of the historic, Piccadilly-based store, said that “Ewan’s passion, expertise and fresh thinking will help take Fortnum & Mason into the next stage of growth.” Spears Magazine described him as “one of the most influential people on the British food scene”. He joined Fortnum & Mason from Selfridges, where he was executive director for food, restaurants and online. In his seven years at Selfridges, where he was responsible for its acclaimed food hall, Ewan was part of an executive team which transformed the department store. Twice in that period, it was named Best Department Store in the World by its peers. Ewan has a strong background in food retailing, He joined the Sainsbury management trainee programme at 17, and progressed through the ranks to the post of food buyer. He then joined the food services supplier, Brakes, where he held a number of senior posts before being approached by the Weston family to take charge of Selfridges’ food offering. Ewan’s presence has already been felt in his relatively short time at Fortnum & Mason. Sales over the Christmas period of 2012 were the highest in the store’s 305-year history, and the hugely successful launch in early 2013 of a new jewellery department, curated by Stephen Webster, was another clear sign that Fortnum & Mason is now doing things differently. More initiatives that re-affirm F & M’s commitment to style, quality and delivering a sense of pleasure to its customers will be unveiled on an ongoing basis. Ewan lives in London. He numbers almost every leading chef in Britain among his friends. He is a dedicated tweeter (@ewanventers) and shares his opinions – largely on gastronomic matters – with his almost 2,000 followers.